In this manuscript we report the rational, molecular design of solid-state polymeric materials where mechanical stress alone initiates a chemical reaction that provides assessment of the stress state prior to failure. Building on our prior findings for mechanophore-linked polymer chains in solution (Hickenboth et al. Nature 46, 423, 2007), we demonstrate that commonly encountered mechanical forces can be translated into selective covalent bond activation in bulk polymeric materials, triggering a productive, localized mechanochemical reaction. 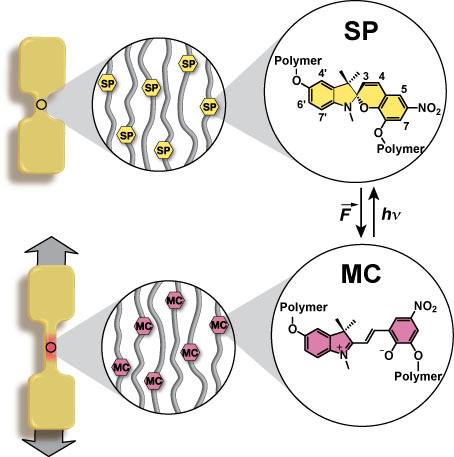 We report force-induced, preferential covalent-bond activation in mechanophore-linked elastomeric and glassy polymers. 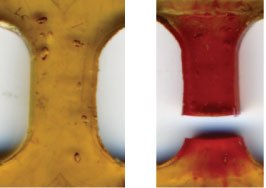 Confirmation of local chemical reaction is provided by a colo r-generating mechanophore that undergoes a reversible electrocyclic ring-opening reaction under tensile stress. We create mechanoresponsive synthetic polymeric materials through a powerful, molecular based strategy, whereby force-activated mechanophores are linked directly into or serve as cross-links between polymer chains in bulk polymers. The mechanophore motif requires efficient transfer of external force to a relatively small number of specific bonds in the bulk polymer. The molecular structure of the mechanophore and the attachment points to the polymer chains are critical parameters for mechanochemical activation. In order to establish that external forces can locally activate a mechanophore linked into elastomeric or glassy polymer solids, we first selected a colour-generating mechanophore with the potential to undergo a force-induced, 6-π electrocyclic ring-opening reaction as shown. Extensive molecular simulations such as Steered Molecular Dynamics (SMD) supported the design of this mechanophore.